The all foam formula of Super Spacer® blocks the heat escape path and provides one of the best thermal performances in the industry. Condensation can lead to more than mold it can increase the likelihood of fungi, viruses and mites that cause respiratory infections, allergies and asthma. 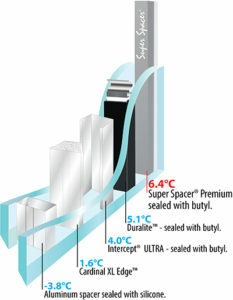 Durabuilt’s Super Spacer® helps keep the glass surface warmer, reducing the risk of condensation and all that follows. Improved sound absorption over traditional metal spacers is achieved as a result of the closed-cell polymer foam in the Super Spacer® that transmits very little sound, keeping the decibels down. Our all foam formula offsets the effects of temperature changes, barometric pressure, wind load and glazing pressure. The end result is less seal failure and fewer stress cracks. Super Spacer units withstand 60°C temperatures, 95 – 100% humidity and constant UV bombardment in the world’s toughest durability test – The P-1 Chamber. Considered by many engineers as the world’s toughest simulation, one week in the P-1 Chamber is equivalent to one year in field; Super Spacer survives 75+ weeks *. Metal can’t bounce back the way Super Spacer® can. As a result of Super Spacer’s® 100% memory formula (TSS technology), it will expand and contract, but always return to its original shape. Rigid metal and plastic spacer’s cannot compensate for the natural expansion that occurs daily in insulating glass – especially with western Canada’s extreme temperature fluctuations. Many of today’s windows offer glass packages with “warm edge technology.” The problem with these highly conductive metal-based insulating spacers, is that they can cause heat/cold transfer to flow through a window the same way you see heat conduct from the stove to a hot skillet. Durabuilt’s Premium grade Super Spacer® can provide up to +10.2˚C warmer temperature at the edge of the glass. Simulations performed by Enermodal Engineering Ltd. using window 5.2 and Therm 5.2 as per NFRC100-2001. Outside temperature -17.8°C, inside temperature 21.1°C. Double-glazed Low-E glass with Sungate 400 with argon fill. Temperature results shown are average temperatures. [Test Reports EIG10009w, Oct. 15, 2010 – doubles and EIG11001w, Dec. 9, 2010 – triples.] Keff is per NFRC 101-2010.